In this HR for Humans story, Nick Herro—a Manager of Tools Engineering at Namely—reflects on his experience returning to work at Namely after two years away. For more stories at the intersection of work and life, follow @namely_hr. You can also submit your stories here. In 2014, I was working for a company called Blenderbox. Namely, then a startup, was sharing our office space, so I got to know the team pretty well. I was inspired by the work they were doing and impressed by how quickly they were growing, so I left Blenderbox to join Namely as a Software Engineer. The company was still in its early stages, so there was a great vibe—scrappy, but fun. The engineering team was a great community, and I really respected my manager Ed and the rest of the team. The leadership team was great about managing a growing number of people as the company scaled. Working with really smart and nice people made for a positive work experience. But in 2015, after nine months at Namely, an opportunity came up for me to be employee number one at a young startup. I saw how quickly Namely had grown, and it had long been a goal of mine to do the same thing: start a company from scratch. I left Namely on really good terms with Ed and the team. I let them know I had a great experience and was really grateful to them, but wanted to pursue this exciting new opportunity. I spent two years at MikMak, building their engineering team and their product. I had a great time, but the early startup culture was much higher stress than anything I had anticipated or experienced before. 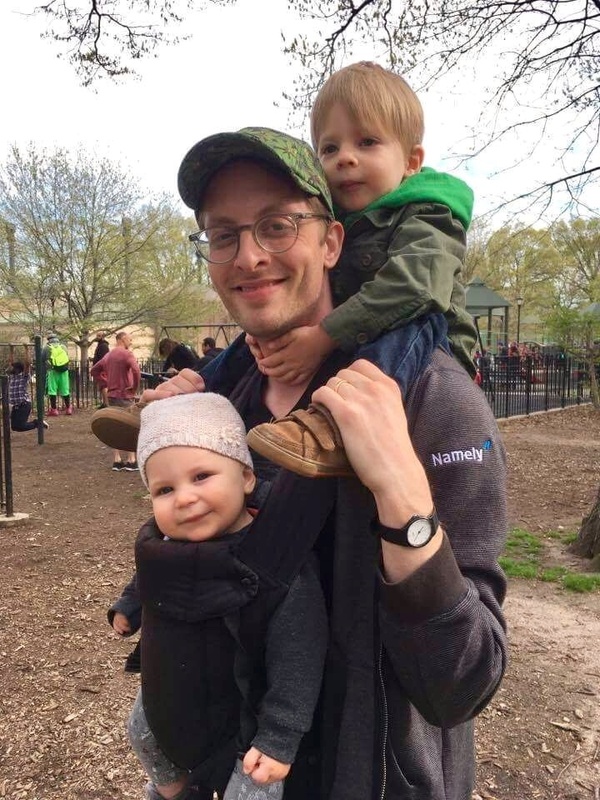 When I was at Namely, I had a baby and I felt very supported, but the demands of the new company had me working around the clock. I had another child during this time, and six months later I realized that this lifestyle was not sustainable. The lack of work-life balance was not working out for me, so I started looking around. I worked with recruiters and interviewed for some opportunities with exciting companies at varying stages of growth. At one point, I reached out to a former Namely colleague, and he told me how quickly the company had grown and predicted things were only going to get better. This colleague put me in touch with my former manager Ed, who quickly brought me into the office for an interview. A lot had changed since our early days. I loved how the office space had evolved, and I could feel myself stepping out of the chaotic world of young startup culture and coming into something that felt a lot more supportive, which was important to me. I had a great conversation with everyone I spoke to, and they made me an offer. I ended up joining and working for Ed again, which was very familiar and comfortable from my time before. Since rejoining, it’s been a really smooth reintegration. I knew how much Namely had changed, just from keeping in touch with Ed and other coworkers during the 2 years I was gone, so I had an idea of what to expect. When I came back, I went through onboarding, which helped me get up to speed on the new office processes that did not exist when I first joined. The biggest plus about rejoining has been the support I feel from everyone I work with, which includes people from HR, Finance, and of course my own team. Coming back has given me the stability and work-life balance I was looking for. I’m still challenged in my role, but it’s not the same level of stress that came with working at an early-stage startup where the ground is constantly shifting under your feet. At Namely, even though I have a well-defined set of responsibilities, I have so much access to everyone else in the company and still feel very challenged and integrated in a good way. Namely is a totally different company now, but elements of the culture have remained the same, and this has a lot to do with the people. Coming back to a handful of colleagues I had worked with previously made the transition a lot more comfortable. The internal culture of the office is much different than when we were working in a smaller space with a smaller team, but in general the culture has stayed the same, and I think that’s driven primarily by the leadership. Wish you could bring back top talent? Check out our complete guide to boomerang employees.